I learned something new and important today that I bet most dog owners don't know: Canine Gastric Dilatation-Volvulus (GDV) or bloat in dogs is the second largest canine killer after cancer. Death from bloat can be painful and truly horrible for dog and owner, so it's good to learn what you can do to prevent it from ever happening. As in humans, bloat is caused by excessive amounts of air, fluid and/or foam present in the stomach, causing the stomach to twist, turn, and swell, obstructing air and blood flow to the dog's vital organs. Anxious dogs, or dogs temporarily faced with stress, dogs with a first degree relative who bloats, big dogs with narrow chests, dogs that engage in activities that result in gulping air, dogs who drink a lot of water before or after eating, and dogs that eat very fast, are more prone to bloat than other dogs. Eating too fast and drinking too much water at one time are both activities you can help control. Omega Paw has a product which helps you control these activities. 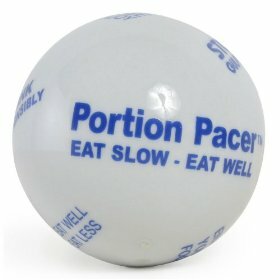 It's the Portion Pacer. 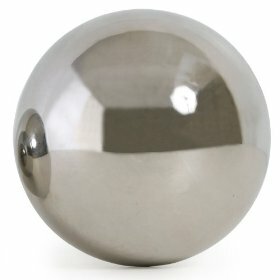 a ball-shaped portion and speed controller that you put in your dog's food and/or water bowl. Your dog is not likely to want to play with the ball, as it is made in stainless steel or porcelain, and those materials don't cozy up to canines too well. The claims are and testing results conclude that the Portion Pacer slows down canine eating and drinking behavior by up to eight times! It was found to prevent choking, vomiting, and gulping; gulping is the leading cause of bloat. Slowing down the pace of eating and drinking is something owners can and should do immediately, especially when puppies are inclined to fast-consumption behavior. Portion Pacer is available in small (2.875") and large (3.5") in dishwasher safe stainless steel and porcelain. There are several other behaviors dog owners should look for and try to control. For information about risk factors, see the 5-year study published by Purdue University School of Veterinary Studies and Globalspan's excellent comprehensive coverage of Bloat In Dogs. Both sources contain information every pet owner should know!